Fifty years ago this week Broadway witnessed an event it never expected – especially considering what had happened only seventy-one days earlier. On Feb. 8, 1969, 1776 began its out-of-town tryout in New Haven to little enthusiasm. On April 20, 1969, it won the Tony Award as Best Musical. The show had been kicking around for a decade before anyone became serious about producing it. A musical by Broadway nobody Sherman Edwards, pushing 50, about America declaring its independence from England? Edwards’ interest in history had taught him that representatives from the thirteen colonies didn’t all say “Yea!” when voting. During that hot Philadelphia spring and summer, the Second Continental Congress’ debates were hotter still. So 1776 would have some conflict. But the audience knew how the story would turn out! And with fifty-six delegates signing the Declaration of Independence, what producer could afford that payroll? Where would be the romance that was the hallmark of all musicals? Without fail, every week of the twentieth century had seen at least one Broadway musical contain a song that had the word “love” in its title. 1776 didn’t. Frank Loesser, though, was an early champion. He encouraged super-agent Flora Roberts to listen to Edwards’ score. Wasn’t Roberts surprised when she heard the opening number “Sit Down, John!” – the angry response that independence advocate John Adams was receiving from his colleagues? She got goosebumps – and then got bookwriter Peter Stone on the phone. Stone had won an Emmy (THE DEFENDERS), an Edgar (CHARADE) and an Oscar (FATHER GOOSE). True, on Broadway, his only credit was the book for the unsuccessful KEAN, but Roberts still believed that Stone could be good for Edwards. No. Stone wasn’t interested, not even enough to read or hear 1776. Edwards kept at it. He decided to add women. But the two couples he chose wouldn’t fall in love in front of the audiences’ eyes. By the year 1776, Thomas and Martha Jefferson had been married for four years; John and Abigail Adams for nearly twelve. Long-term marriages aren’t known for their romance. Besides, Edwards only found room for two songs and one reprise for the Adamses and a sole song for Martha without Thomas. “He Plays the Violin” was only about him (and his prowess as a lover). It was a waltz that she didn’t even dance with him but with Franklin and then Adams. There was no romance there. That was the show’s only real choreography in an era when two dance-heavy shows – Gower Champion’s HELLO, DOLLY! and Jerome Robbins’ FIDDLER ON THE ROOF – were contending to break MY FAIR LADY’s long-run record. Producer Norman Twain wasn’t on anyone’s A-list. His five plays had averaged twenty-six-performances, although his one musical did manage to last seven months. But when he took an interest, Edwards let him have an option. Twain went director-shopping. Arthur Penn, Gene Saks and Peter Coe said no. Albert Marre, Garson Kanin, Joseph Anthony, Gerald Freedman, Daniel Mann, Stanley Prager and Tyrone Guthrie all expressed some interest and THEN said no. Howard Da Silva wanted to stage it, but Twain rejected him before finally dropping 1776 in early 1967. Stuart Ostrow, Loesser’s former general manager and vice-president, remembered it. As a producer, he’d had two flops before the modest success of THE APPLE TREE. Ostrow liked the score, but said he’d do the show only with a better book. Edwards reluctantly agreed. Ostrow approached Arthur (GYPSY; WEST SIDE STORY) Laurents, which made sense, and William F. Buckley, which didn’t. The author/commentator had had as much experience writing libretti as Edwards had. Stone was again recruited. By this time, he’d now had two Broadway flops, thanks to SKYSCRAPER. “Honestly, I was sick of the calls,” Stone would later say. And yet, Stone said “it took me a long time to commit” because he’d had the same questions that so many others had raised. Where’s the suspense? Then he thought of Reginald Rose’s TWELVE ANGRY MEN, where one juror held out against eleven others who were sure the defendant was guilty. Stone would make the ratification of The Declaration seem impossible at the start because John Dickinson of Pennsylvania would be unswervingly opposed to renegade Adams. How Dickinson would ultimately be thwarted from preventing American independence while never changing his stance would provide the suspense. Stone didn’t endear himself to Edwards by demanding that many songs be cut. “Sextet in Revolutionary Time,” “Tea Party,” “Concord, Lexington, and Bunk,” “A Letter from Silas Deane” and “Are You That Man?” all went. So did Abigail Adams’ cheer-up song to soldiers after they’d endured a terrible setback. So the score became shorter than many: twelve songs total. One stretch goes more than a half-hour without music – a length that’s never been equaled. What’s stranger is that no song has an A-A-B-A structure, which the majority of show songs up to that time routinely had. Also reduced were the number of delegates. Economics were obviously a factor, but Stone felt that there’s “a limit to an audience’s ability to assimilate and keep separate a large number characters as well as the physical limits of any stage production.” So a “mere” twenty-three congressmen would be employed. Stone didn’t make Dickinson a fat, effeminate lisper as lesser writers would have done. His character is a stalwart, smart man who gives excellent reasons why the colonies shouldn’tbreak away from England. No true-blue American would ever side with Dickinson, of course, and yet when he argues that “We have no army, no navy, no ammunition, no treasury, no friends,” everyone including Adams must admit – at least to himself, however reluctantly – that Dickinson makes a good point. How could America win a war fighting with the world’s most powerful country? So who’d direct? Ostrow sought out Bob Fosse as well as Champion and Robbins. All declined, but Robbins made a recommendation: Peter H. Hunt. What, the lighting designer of four failed Broadway productions? At least with the choreographer, the replacement was a step up: Rhoda Levine, who’d done one children’s show off-Broadway, was replaced by Onna White of THE MUSIC MAN and MAME fame. For Adams, Hunt cast William Daniels and for Franklin, the previously discarded Howard Da Silva. Neither they nor the rest of the cast had names that meant anything at the box office. A snowstorm on opening night in New Haven made the critics and most audience members stay home. Once they did attend, they didn’t respond too well to the overly long show. Cuts had to be made, and two of Da Silva’s songs went by the wayside. He quit as a result, and only after some hectoring from two-time Tony-winner Alfred Drake, did he return. 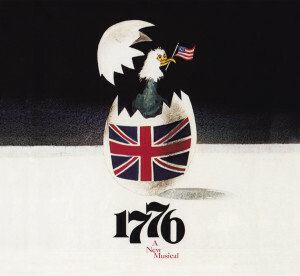 Onto Washington, where Edwards, influenced by Fay Gage’s logo of an eaglet emerging from an egg, wrote “The Egg.” The show was working better, but who expected that on the eve of the Tony nominations that the critics would rave? The following day, 1776 received six nominations. It would have received eight if the book and score categories hadn’t been eliminated that year. But it only became eligible for five when William Daniels said he didn’t want his nomination. Sounds crazy, no? But Daniels was billed under the title, and in those days the Tonys foolishly regarded that to mean a performer wasn’t starring in a show. That regulation has since been changed, thanks to Daniels. Leave it to 1776 to break yet another rule.